Since their formation in 2005, VisitBlueMountain offers accommodation options such as cottage rentals, lodges, chalet rentals, and vacation rentals to serve the tourism industries with quality accommodations in The Blue Mountains and Collingwood area. The founders of VisitBlueMountain, a one-stop shopping platform for quality accommodations in the Blue Mountains and surrounding areas, are pleased to announce that they have just unveiled their newly revamped website redesign http://visitbluemountain.com. As a company spokesperson noted, the newly redesigned website features a more user friendly booking system, and does an outstanding job to allow users to view and book all rental and vacation properties in the Blue Mountain Ontario Area. By staying within any of the VisitBlueMountain vacation properties, guests are just a short drive to Northwinds Beach, which offers white sand on the open waters of Georgian Bay. Additionally, guests are only minutes away from Scenic Caves, Scandinave Spa, and many other exciting attractions in the Georgian Bay region. VisitBlueMountains has over 12 golf courses and 5 mini-golf courses for friends and family to enjoy. The spokesperson adds, “It’s hard to get bored with all we have to offer.” Whether people plan to take a trip to Blue Mountain in the summer or the fall, the colors of nature, crisp air, and stunning views await those that enjoy outdoor activities such as fishing, golfing and much more. 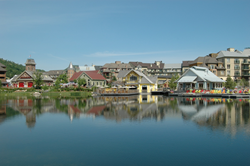 Year-round, the Blue Mountains and Collingwood area attracts visitors to more than 1,000 luxury accommodation units, and 45 unique concept restaurants, bars, and retail stores in Blue Mountain pedestrian Village. One of the major attractions the Blue Mountains has to offer corporate businesses is their 53,000 square foot state-of-the-art business conference space, especially designed to cater to year-round corporate meeting groups. Created with the user experience in mind, VisitBlueMountain’s redesigned website provides their users with pictures of the available properties to stay at, as well as quick access to the things to do when staying there. VisitBlueMountain’s new website will be updated on a regular basis with room availability and tourist information. Key features of the new website include a cleaner and more attractive design, as well as many answers to frequently asked questions. VisitBlueMountain is also excited that their new website offers visitors information on events taking place in the area, including live music and festivals, so that guests can get the most out of their trip. VisitBlueMountain’s new website also offers guests a way to qualify for discounts within The Blue Mountains and Collingwood area on equipment rentals and dining selections through their Last Minute Club. Visitors are encouraged to explore the new website, and stay connected with the company through the various social media platforms.